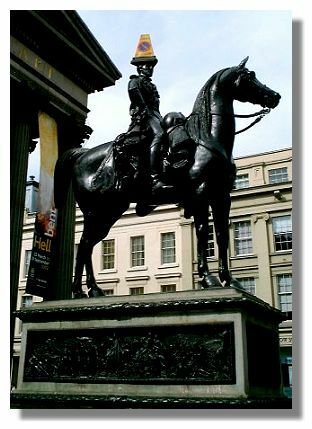 With Glasgow's well known sense of irrevernet humour, it is perhaps appropriate that the last page in this Photo Library should be of a statue which permanently has a traffic cone on its head. Of course, the statue to the Duke of Wellington, the conqueror of Napoleon at the Battle of Waterloo in 1815, is not supposed to have a traffic cone. Wellington stands imposingly outside the Gallery of Modern Art and some years ago, a cone appeared overnight, presumably the result of a youthful prank. Although it was removed, it kept magically re-appearing and eventually the authorities gave up.